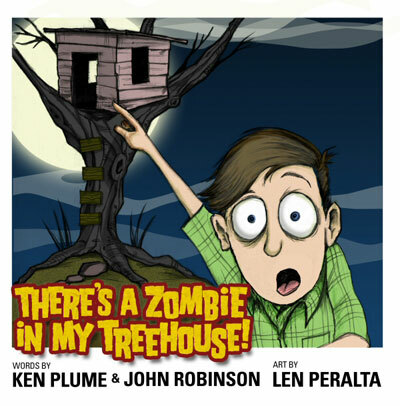 GeekDead week seems like the perfect time to take a look at There’s A Zombie In My Treehouse, a fun little book from über-geeks, Len Peralta, Ken Plume and John Robinson. Although the book came out last year, it’s never too late to talk about zombies, especially when they’re hidden away in treehouses. The story is about Johnny, a normal kid living a normal life in a normal town … until one day when he discovers a zombie living in his treehouse. As you can imagine, things kinda go downhill from there. It’s an enjoyable story with great illustrations, but be warned; the ending is more campfire story than fairytale. All the same, There’s A Zombie In My Treehouse is great kiddie horror fare.